Our very democracy is under attack. The fact that Putin hacked our 2016 elections to help Donald Trump win is scary. So is the fact our Republican led government is not taking steps to prevent them from doing it again in 2018 and 2020. Even scarier is Trump's obsequious siding with Putin over our intelligence agencies on the matter. But the the scariest thing, the only way Trump can get away with collusion, obstruction of justice and turning the presidency as an authoritarian for-profit branch of the Russian government, is if the GOP led congress, is if the GOP continues to let it happen. So far the GOP has shown no sign they are willing to defend our democracy. But I have a plan to either shame them into siding with our country or expose them for their treasonous attempts to shield Trump and Putin from justice. 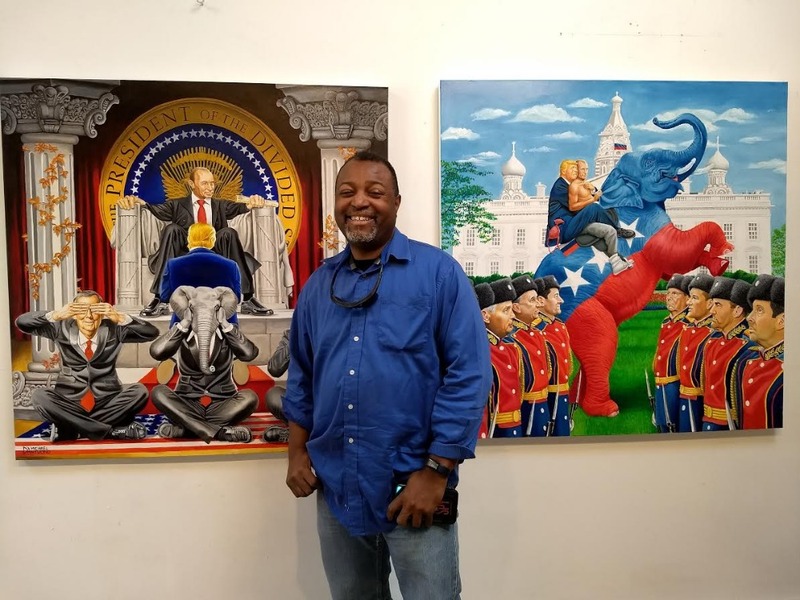 In an effort to get the GOP to put country over Trump and protect us from more Russian hacking of our elections, I put my art on three mobile billboards and had them circle the Capitol Building for a week. People in the streets and on the internet have called for more trucks to go to towns and cities across the country. Video of the Washington run. I want to honor those wishes, shedding light across the country on the GOP’s complicity in Trump’s attempts to obstruct justice. Perhaps then, they will be shamed into doing the right thing and put America’s needs over what they mistakenly think we will benefit their careers. Three trucks cost approximately $12,000 for 5 days, depending on the city. We are initially tying to raise enough for the first fleet. Once we raise enough to do a city we will. We will do as many cities as funds will allow. If the GOP allows Trump to have Putin come to the White House I will bring as many back to DC. We need your help, before Trump feels emboldened by GOP support that he can fire Mueller, Rosenstein or Sessions without impunity from the GOP congress. I truly hope to raise enough to do at least five cities for maximum impact in directing the national conversation to the GOP's somewhat treasonous complicity. Please give what you can now. Ask yourself, “How much is democracy worth to you?” Together, we can shape America’s future. Great News! My mobile billboards will be in a major city third week of October getting people to vote blue! This time there will be one on women's rights and one that plays my video, The House of a Treasonous Traitor. I'd like to thank all of you who made it possible. After Trump's behavior at the press conference yesterday it's even more critical to pressure the GOP to side with our country and protect us from tPutin's hold over our president. I hope you will encourage your friends to contribute to the cause. I will be going to LA in a couple of weeks to meet with people to hopefully help us raise enough money to meet our goals. Thanks for all your support!!! I want to thank everyone for a great first day!!! With many in the GOP and conservative media supporting Trump's wildly unsubstantiated "Spygate" claim, our counter propaganda mission is even more imperative. In addition to donating, sharing our campaign with as many people as possible will help it reach it's full potential.